I’m going to go ahead and make a big, bold market claim: we can thank Salesforce for the rise of account-based marketing. You know the saying “a rising tide lifts all boats”? Well, let’s look at Salesforce. If it wasn’t for the success of this organization, the B2B marketing industry never would’ve seen such a rapid evolution of marketing technology (MarTech). Subcategories of MarTech — such as marketing automation platforms (MAPs), content marketing systems, and predictive analytics software — all exist because of their ability to integrate with the Salesforce CRM. Coming full circle, it’s because of the ongoing evolution of all these B2B MarTech tools that the account-based marketing (ABM) revolution is here. You may be wondering, “How can Salesforce help me do ABM?” Simply put: you cannot do ABM without a CRM, or else your attempts to do account-based marketing will be an entirely manual process. For any B2B sales organization, the CRM is the central data repository and tool of record. Thankfully, you’ve got the best CRM in the world with Salesforce because of its ability to integrate with pretty much anything and everything through its robust API. Having the right technology is the first step, because technology gives you the ability to do ABM at scale, reaching hundreds or thousands of contacts at your best-fit accounts. One key distinguishing factor from ABM compared to traditional marketing efforts is the way the sales team is aligned with marketing to engage accounts in a concerted way across their buying experience. Using your CRM tracks this activity across the entire account’s journey, from prospect to customer. Here are 4 ways to do account-based marketing using Salesforce following the #FlipMyFunnel model for account-based marketing. Your Salesforce CRM is full of data on your prospects, opportunities, and customers. Using the data you have, you can build your ideal customer profile (ICP). Having a well-defined ICP is essential for taking an account-based approach because your marketing activities, tactics, and programs will be laser-focused on a best-fit set of accounts. Basic account data: firmographic data such as industry, company size, even geography, and the combination of these data points is critical for taking a first pass at creating manageable segments to go after with ABM campaigns. Amount of revenue the customer pays your company: The total annual recurring revenue (ARR) or monthly recurring revenue (MRR) is a starting point for all of your customers. You’ve heard the mantra that 80% of your revenue comes from 20% of your customers, and unless you’re a purely transactional organization, the amount of revenue matters. Propensity to buy: Why your customer wanted to do business with you and the products they selected is essential. The product usage level information such as licenses, product lines owned, contract length/time to renewal, implementation status, etc. all help with ABM. Many companies also have a sort of scoring system based on their relationship, such as “red/yellow/green or advocate/happy/neutral/unhappy”. Predictive data software providers such as Bombora or Everstring help with homegrown models for propensity to buy, or additional data on in-market signals. Service resources expended on each account: If you have a customer who is not paying your company very much revenue and they require lots of attention, then they are probably not an ideal fit for your business. You’ll know how much hand-holding is required by looking at your notes in Salesforce. 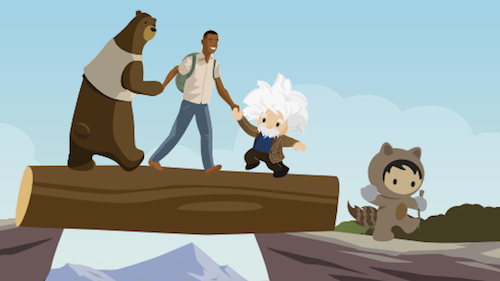 When you uncover the key attributes of your best customers within your existing data in Salesforce, you’ll develop a baseline of the types of accounts you know are a good fit for your business. Remember, there is no “one-size-fits-all” for your ICP. This has to be unique to your own organization based on your products and services and the types of companies that will be most successful partnering with your business. After you’ve defined your ICP, the next step is to find additional companies who meet your ideal account profile. Some of this data may already exist in your Salesforce instance with your current prospects and opportunities. Additionally, you can segment this data using Salesforce Pardot or another app from the Salesforce AppExchange. The Prospector tool from Salesforce Data.com allows you to have verified data from the get go. It offers more than 100 fields of account data, including corporate linkage through the D-U-N-S number from Dun & Bradstreet. Lately, our team has had “Salesforce cleaning parties” with pizza, beer, and good music for the sales reps who are analyzing all these accounts to ensure accurate contact data. 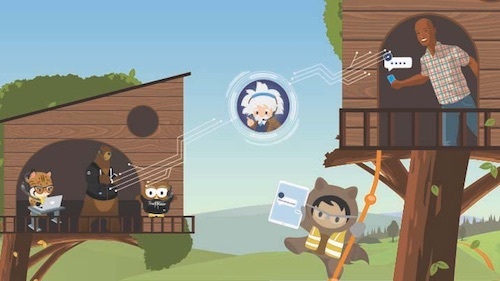 For a more tech-based approach, data services—like Data.com Prospector—can also plug into Salesforce and allow you to search and import contacts at specific accounts. 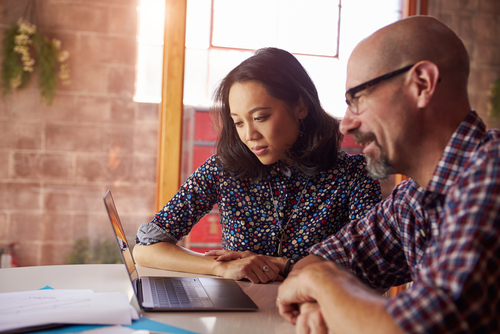 Now that you’ve identified your target accounts in Salesforce and ensured the contact data for each of those accounts is accurate, you can begin the fun part of account-based marketing: engagement. To do this, you need a strategy for how you’ll engage the contacts in your target accounts. Depending on what stage of the purchase decision the account is in, you’ll need to use different activities and tactics. At Terminus, for example, we use PFL to automatically send a copy of my book, Account-Based Marketing For Dummies, to a key contact on any account that turns into an opportunity. 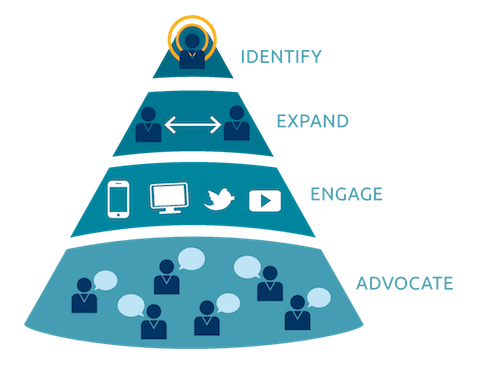 The fourth and final stage of account-based marketing is Advocate. In the first stage, Identify, you determined your target list of accounts. In the second stage, Expand, you added more data to your target accounts with contacts for marketing. In the third stage, Engage, you surrounded those contacts in the account with content, activities, and marketing messages, thus increasing pipeline velocity to help sales close the deal. And all along the way, your Salesforce CRM was recording this account activity. The same way you use Salesforce and marketing automation for monitoring account activity among your prospects and customers, you can also use it to see who among your customers is most active. The Terminus Cloud for ABM – With 40+ partners that integrate with Salesforce to do ABM at scale gathering data, reporting on activities, organize dashboards for results, etc. ABM Stack Grader – Build your own MarTech stack or grade your current stack to see how you can do ABM at scale. More than 200 B2B marketers have graded their stacks! Editor’s Note: Portions of this material were published in Sangram Vajre’s Account-Based Marketing For Dummies. Sangram Vajre, co-founder and CMO of Terminus, is a passionate Marketing geek at heart and loves to solve problems, both analytically and creatively. In today's marketing world, when companies need to rapidly adapt to changing buyer-centric communication, Sangram finds comfort in all things technology to keep pace with this challenge. Over the years, Sangram has amassed invaluable experience from his exposure to startups, consulting, and global companies. Most recently, Sangram headed up Marketing at Pardot, which was acquired by Salesforce in 2013. You can follow him on Twitter at @sangramvajre.